CAC Award Winner Larry Hennig Gets New Game Card! Wrestling legend Larry Hennig, the receipt of the Cauliflower Alley Club’s 2015 Iron Mike Mazurki Award, will get a cool new color game card in the CAC Reunion pack! 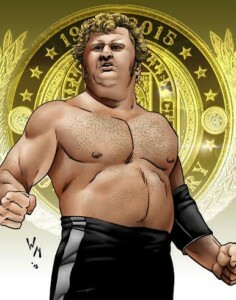 Hennig has won World tag team belts on several occasions, three times with Harley Race. He also won a tag team title with his son Curt Hennig. Larry Hennig was hated as a heel and loved as a fan favorite, you can use him either way in your Legends fed! The CAC Reunion pack will be released exclusively at the 50th Anniversary CAC Reunion on April 13-15 in Las Vegas! Game creator, Tom Filsinger, will be on hand with the new game pack, be sure to find him! If you can’t attend the reunion be sure to order the CAC Reunion pack, which will start mailing on April 15. And don’t forget to add our other new release EVOLVE 2, to your order! Both games mail at the same time! ← Roderick to put STRONGHOLD on Evolve Roster!